So what type of images are helpful to researchers? In order to catalogue individual animals we need to ensure we have as many angles as possible of each seal which is photographed. The MINIMUM requirements to identify an individual leopard seal are photographs of the left and right sides of the face and body, and also its underside of its belly. How can I take great images? We understand that people want to have photographs of leopard seals (and that we ask for copies for the research project). However, we can’t stress enough that no photograph is worth harassing or disturbing ANY animal for. Therefore, we hope these simple guidelines will mitigate any issues and help you to get great images. We also hope that they will not only provide you with pictures you can cherish, but if you submit your images to LeopardSeals.org, they will also help towards a better understanding and therefore protection of these amazing apex predators. Please see the ‘Report a Leopard Seal’ page for details, including a release form. A leopard seal lifts her head and stretches her fore-flipper, after sleeping for nearly 2 hours. 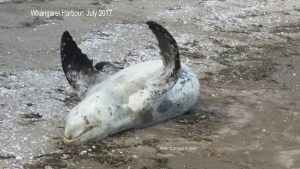 Remember, all seals in New Zealand are protected under the Marine Mammals Protection Act 1978 (MMPA) and that you can be prosecuted for harassing or disturbing seals. Please see our ‘Approaching Leopard Seals‘ page in conjunction with this information about how to photograph them. Be patient. If you sit quietly and wait, a leopard seal will typically lift its head to survey its surroundings and at that point it may also yawn or roll around and stretch, showings its spectacularly large fore-flippers. 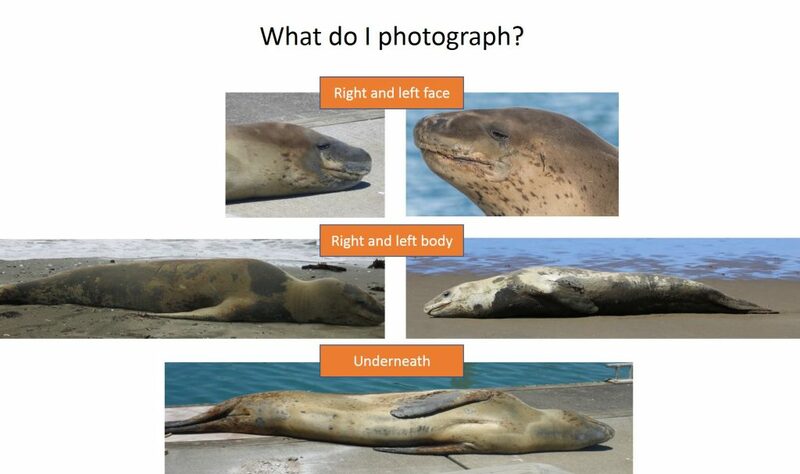 The photographs collected by LeopardSeal.org Team Members are the result of, literally, 100’s of hours of watching leopard seals. A leopard seal stretches its flippers whilst resting. Use a zoom lens (or zoom on your phone). Remember, you should not approach closer than 20m. Using a ‘long lens’ with a good zoom will allow to get photographs that appear closer than you are. If you have the option to set your camera to ‘RAW’, these types of images are higher resolution and you can then crop in the image and then convert to jpg for easy viewing and sharing. Below are some examples of pictures taken with a 200mm zoom lens, set on RAW and subsequently cropped and converted to jpg. If using your phone, zoom in to the maximum amount. Some phones.cameras have a ‘steady shot’ or ‘action mode’ making your image more stable. If you are in a boat and see a leopard seal, you must still maintain a distance of at least 20m. Remember, never feed a seal and don’t deposit fish chum, parts or whole fish into the water near a seal. Leopard seals can have an extremely low profile in the water and may not even raise their eyes out of the water (see the image below). Please exhibit extreme caution to ensure the seal is not hit by your boat. If you are fishing (from a boat or from land) and a leopard seal is in the water nearby, please remove your gear from the water. Leopard seals are curious and may approach live bait, baited hooks or lures and become entangled or get foul hooked. Leopardseals.org takes no responsibility for the actions of members of the public photographing leopard seals. It is each persons responsibility to ensure their own safety and well-being of the seal. As a minimum follow these guidelines on approaching leopard seals and ALWAYS adhere to the Marine Mammal Protections Act (MMPA).